It is important to remember that “advancing” your yoga practice comes from more than just mastering advanced postures. Yoga is more than handstands and twisting shapes: while each asana has a lesson to teach, think about growing your practice spiritually, as well. Set a devotional intention. Why are you practicing today? Setting an intention can guide your practice—and your lifestyle. An intention calls you to bring awareness to a quality, virtue, or something you wish to cultivate. An intention guides your mental state during your practice and can continue to follow you off the mat. Rise early, practice yoga early. Start your day with the sun and practice yoga early in the day. This sets the tone for your day (recall the intention, which guides your mental state), and rising with the sun reinforces your daily commitment to your practice. Consider how Sun Salutations are done to greet the day: energizing your spirit and creativity. An early practice also helps your mind ease into the day before the workday begins. Meditate. Breathe deeply and consciously during your practice. Draw your focus toward breathing, intention, and self-awareness—both on and off the mat. Adding a meditative practice is an essential part of a more advanced yoga practice. Conclude each practice with Savasana (Corpse Pose). There is a reason that most yoga flows and classes end with Savasana, lying horizontally on the mat. Savasana synthesizes your practice with your intention, allowing your mind and body to sync. Savasana is a pose that seems easy enough, but is an ongoing practice for even the most advanced practitioners. By ending each practice in Savasana, you cultivate a meditative state, reset your nervous system, and feel both energized and grounded. Check your attitude and your goals. Ask yourself: Why am I practicing yoga? Eliminate the ego and pride associated with specific asanas, and draw your practice inward. Aspire for internal goals: spiritual growth, mindfulness, or awareness — not external ones based on desire, pride, or mastering a specific posture. Jennie Lee calls us to focus on the process of yoga– not the destination. Go back to basics. In the beginnings of your yoga practice, maybe rushed into your poses. Maybe you felt driven to achieve certain things, take the hardest classes, or try the difficult asanas. These efforts are founded in ego, and an advanced practitioner should return to these fundamentals with humility and precision. By going back to basics, you can refine what you know, focus on proper alignment, and approach each posture with mindfulness. Going back to basics is an exercise in physical precision and emotional growth. These poses will help facilitate a deeper practice, either by focusing on the basics, or challenging you to the next level of balance, strength, and alignment. This deceptively simple pose is a foundation in traditional Sun Salutations. It prepares the yogi for Chaturunga Dandasana, arm balances, and inversions. Plank pose builds strength and proper alignment needed for more advanced poses. Tip: Make sure your wrists are under your shoulders, and your shoulder blades are spread away from the spine, rotating externally. Keep your neck long and spread your collarbones away from your sternum. This essential posture is the foundation for alignment in future arm balances. Chaturunga is infused into every Sun Salutation and most Vinyasa flows—it therefore can be easily overlooked, rushed, or performed with poor alignment. This challenging pose builds strength in the upper body, arms, and core– as well as in the mind. Tip: Review Chaturunga with precise alignment and focus. Hold for longer durations to build stamina. Make sure your spine stays straight and doesn’t sway to the ground. This is an intermediate arm balance that supports strength, extension, and focus. While the full version of this pose includes the top leg raised perpendicular to the floor, even legs together provides a challenge. Without an upward gaze, you can lose your balance. Tip: Slow your breathing and approach this pose with a sense of calm. Enter side plank from Downward-Facing Dog, and make sure that your hips are aligned, stacked on top of each other as you stretch your hand upward. Lotus is a hip-opener that encourages spinal extension, abdominal strength, and meditation. Tip: Lift the crown of your head to the ceiling and keep your spine long. Focus on aligning your head and spine, centering your body. When using this for meditation, be sure to cross your legs differently now and then to avoid injuring the hips. Another twisting posture, this one focuses on extension, strength, balance, release, and detoxification. Spinal twists stimulate the internal organs. Tip: Breathe deeply into this posture, and focus your gaze forward for balance. Keep the shoulders stacked on top of each other, hips square, and feet grounded to the floor. Exhale as you deepen the twist. Half-Moon appears simple, but provides a challenge in strength and stability. This pose calls for attention to balance, extension, strength, and release. Tip: To increase the challenge, lift your gaze up to the ceiling. Be sure to keep your hips in line, and shoulders stacked on top of each other. Another foundational balancing pose, this one improves strength, balance, and alignment. Practitioners should take time to review proper alignment to build strength and mindfulness. Tip: Begin in Mountain Pose (Tadasana), then exhale as you fold forward into Uttanasana. From here, draw energy and strength to bring you to Warrior III. Keep your hips square and ground your feet into the floor, reaching forward with your arms and gaze. This twisting pose prepares you for seated forward bends and twists. This calls for coordination, strength, focus, and flexibility. Tip: Keep the back heel grounded to keep you stable. Here, you need to maintain a solid grounding position and steady gaze to get the most out of this pose. Focus on proper alignment: keep the hips and shoulders square, spine long, and maintain a solid core. This posture builds strength and flexibility. Tip: Beginners can build stamina by resting the extended foot against a chair or wall. This pose symbolizes cosmic energy, strength, and grace. A powerful balancing pose, Lord of the Dance requires strength and focus. This builds strength in the legs, flexibility, and balance. Tip: The full pose calls for you to hold your extended ankle with both arms. Beginners can start with holding the ankle and extending one arm out for counterbalance. This is a chest-opener that also lengthens the spine, releases the shoulders, and calms the mind. Tip: Keep your arms active and don’t let your elbows touch the ground. Hold this pose for 1-3 minutes for restorative benefits. Bakasana is usually the first arm balance that students learn: it is accessible, but builds strength. This foundational arm balance that establishes the strength and alignment needed for more advanced arm balances. Tip: Beginners can bend at the elbows, pressing the knees into forearms until you gain strength. To increase the challenge, straighten the elbows and tuck your knees high, toward your armpits. This arm balance calls for strength and flexibility. The key to this pose is having enough flexibility to twist the outer edge of your knee across the opposite forearm. This pose takes Crow to the next level. Tip: You will want a strong foundation in Plank and Chaturunga to get the most out of Side Crow. Be sure you rest the outside of your knee on your forearm, not your elbows. Wheel is an arm balance that strengthens the upper body, legs, and abdomen. This pose also achieves the benefits of a backbend and inversion, while being more accessible to most beginning practitioners. Tip: Lift at the navel and hips, rather than by pinching your back. Ground your feet into the floor. For an added challenge, try Upward-Facing Staff Pose. Backbends require strength and flexibility. Beginners make the mistake of pinching or tensing into this pose. Tip: Focus on opening the chest, and make sure your knees are in line with your hips as you lift into this one. Plow sets the foundation for shoulder press and shoulder-stand, while reducing backache and promoting deep sleep. 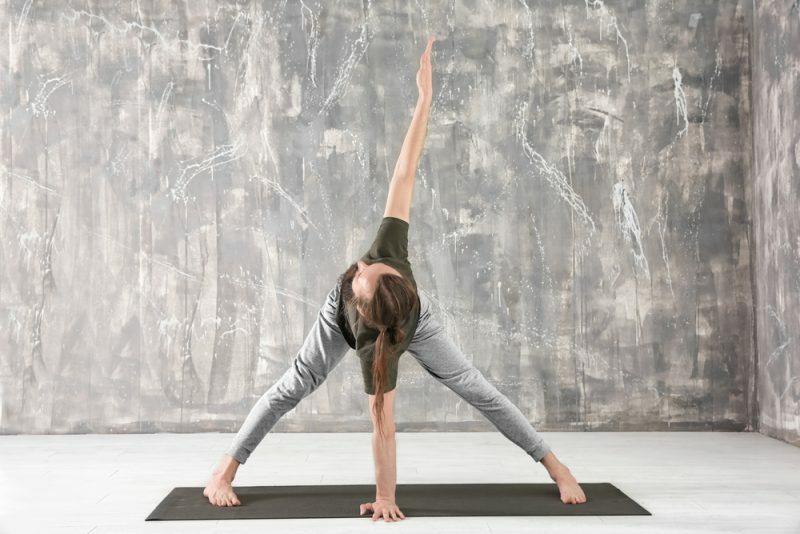 Tip: Beginners should allow their back to bend into this pose, but for a challenge, work to keep the spine straight and hips over the shoulders. This version of shoulderstand is accessible to the intermediate practitioner. It calms the nervous system, stimulates the thyroid gland, stretches the shoulders and neck, and improves balance. Tip: Beginners, use a mat or towel for support as you gain strength. This is an intermediate-to-advanced posture that takes time to master. With proper alignment, this inversion promotes strength and balance, as well as health benefits such as: calming anxiety, improved blood flow, relieving depression, and rejuvenating the muscles. Tip: Beginners learning headstand should focus on supporting the head and neck by lifting through the forearms. Try propping yourself against a wall to learn alignment safely as you build strength. This arm balance relies more on precise positioning than strength, and is a good reminder for practitioners to focus on alignment and form. Shoulder Press appears advanced, but can be accessible to the beginner or intermediate student with focus on alignment and balance over strength. Tip: Ground your wrists to the floor, and lift up through your shoulders. Tilt your torso forward slightly as you raise your hips. Locking your ankles together will provide the counter-balance needed to maintain this posture. Related: Firefly (Tittibhasana). Building on Bow and Wheel backbends is King Pigeon, an extremely deep backbend. This is appropriate only for advanced practitioners. Tip: Intermediate students should begin with the One-legged King Pigeon (Eka Pada Rajakapotasana) variation, which stretches the back, hips, and chest to improve posture. This foundational pose is deceptively simple, but proper alignment sets the tone for many inversions and advanced postures. This is used in traditional Sun Salutations, but can be used as a restorative pose if held for 1-3 minutes. Tip: When you exhale, externally rotate the shoulders, opening the spine and keeping your collarbone open. Pay attention to your alignment of your wrists, shoulders, hips, and spine for full benefits of downward-dog. The revolved twisting position here opens the hips, ribs, and chest while providing an additional challenge. Tip: Think about resting your spine on your straight leg, as you press that leg firmly into the floor. Like the name implies, this is a lighthearted and fun pose. Translated from Sanskrit, Camatkarasana means “the ecstatic unfolding of the enraptured heart.” This pose tests your balance and encourages extension, flexibility, and an open chest. Tip: Enter this pose from Downward-Facing Dog, then bring your weight to the side, as if you were entering Side Plank. Lift your hips to the ceiling, and curl through your upper back to open the chest. Extend your arm for a stretch in your side, ribs, and heart space. This chest-opener loosens the spine and prepares for more advanced backbends. Fish Pose is used to stimulate the immune system, ease anxiety, improve breathing. Beginners should use a supportive prop under their backs for this pose. Tip: For added challenge, perform with legs in Lotus, instead of straight out in front. This asymmetrical arm balance builds strength in your arms and core. It also draws your attention to precision and posture, setting the foundation for successive arm balances. Be sure you have a strong Chaturunga. Tip: Eight-angle pose is more accessible than it “seems” for new practitioners. The key to this pose is a stable arm position, strong core, and locking the ankles together for counterbalance. Advancing your yoga journey calls for you to stretch your comfort zone, both in your physical and spiritual practice. With these tips and intermediate postures, you can take your practice to the next level.